Jiehtanasgáisi (1552) and Olmmáivárri (1533) (Mannfjellet), Storfjord. 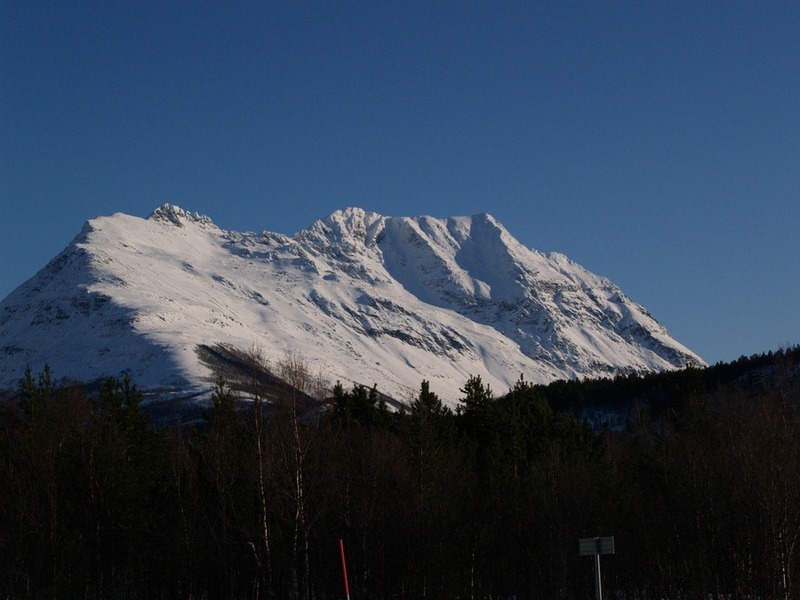 The original Sami name for this mountain is Olmmáivárri, which means The Man Mountain. 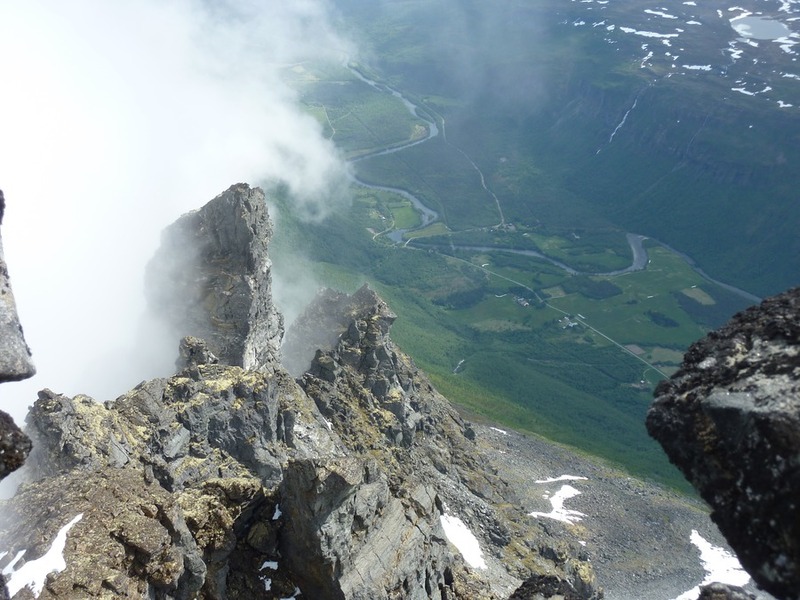 Locals often refer to the whole mountain as Mannfjellet, but the highest peak has another Sami name: Jiehtanasgáisi. Jiehtanas means Jotne (a gigantic Troll) in Norwegian, i.e. The Jotne Peak(s). Mannfjellet´s East side as seen from Lávkavággi with Jiehtanasgáisi to the left and Olmmáivárri to the right. 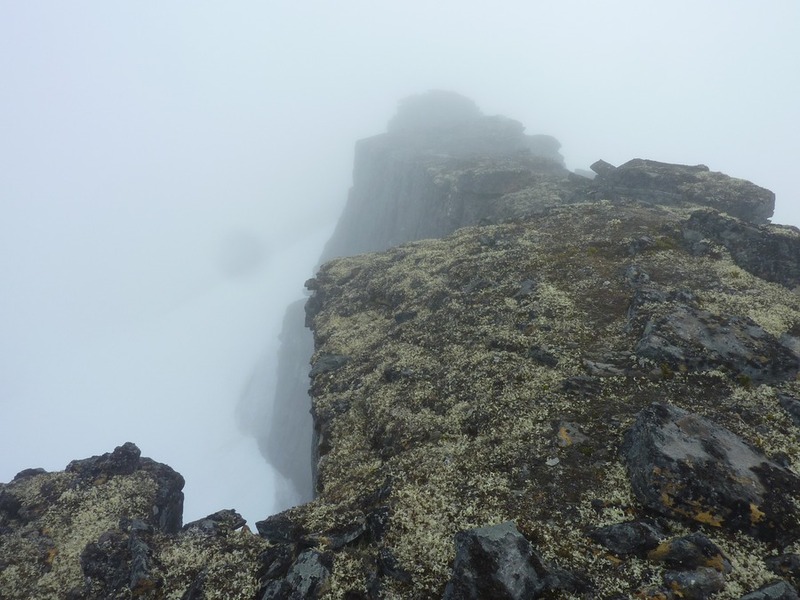 A short description of the East buttress route on Olmmáivárri (the snowy buttress facing the camera) followed by the NE ridge (left hand skyline) to the summit of Jiehtanasgáisi (1552). 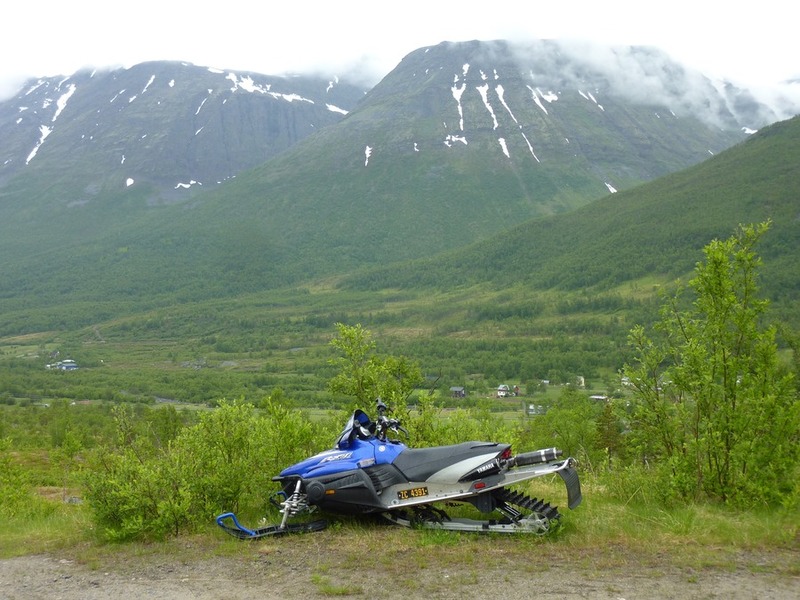 Start from Søreng in Kitdalen and follow the dirt road that leads into Sørdalen. 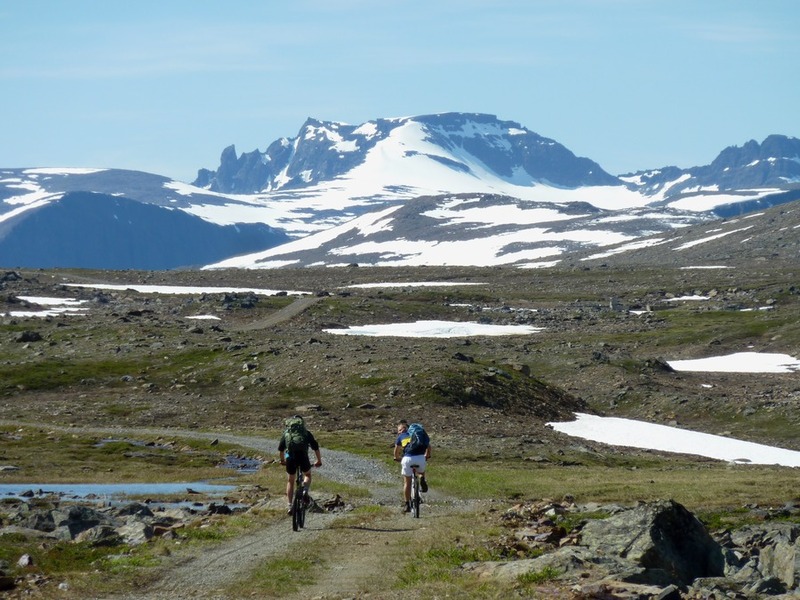 You can ride a mountain bike for approx. 5 km into the valley. 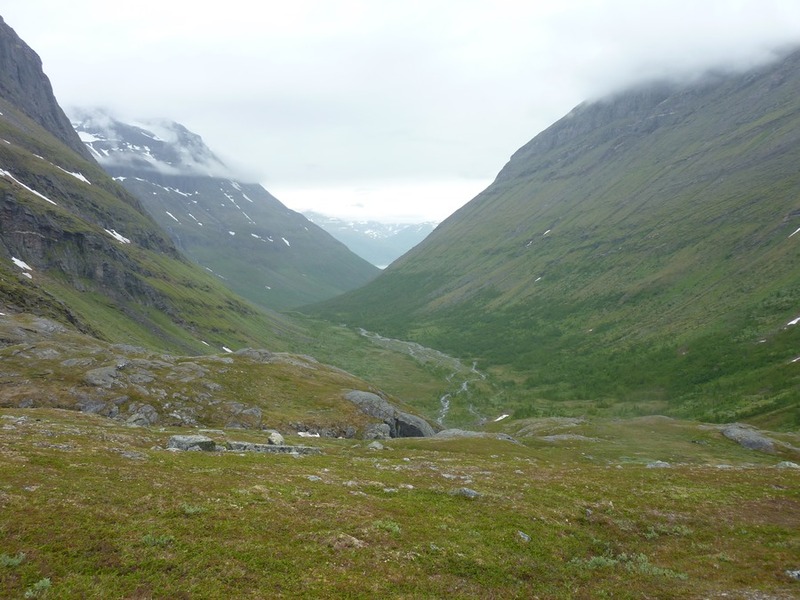 From the treeline follow the river up to the lake Fiskelaus (886) and later the lakes Bogelvvatnan (940). 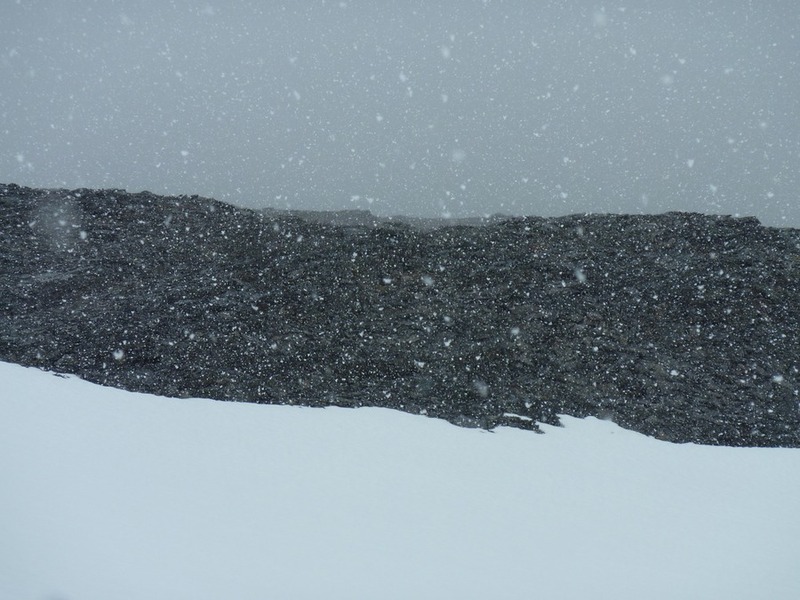 Scramble up the scree (20-30°) to the plateau (approx. 1250) SE of the buttress. From there you should have a good view of the buttress which is straightforward and no steeper than 30°. 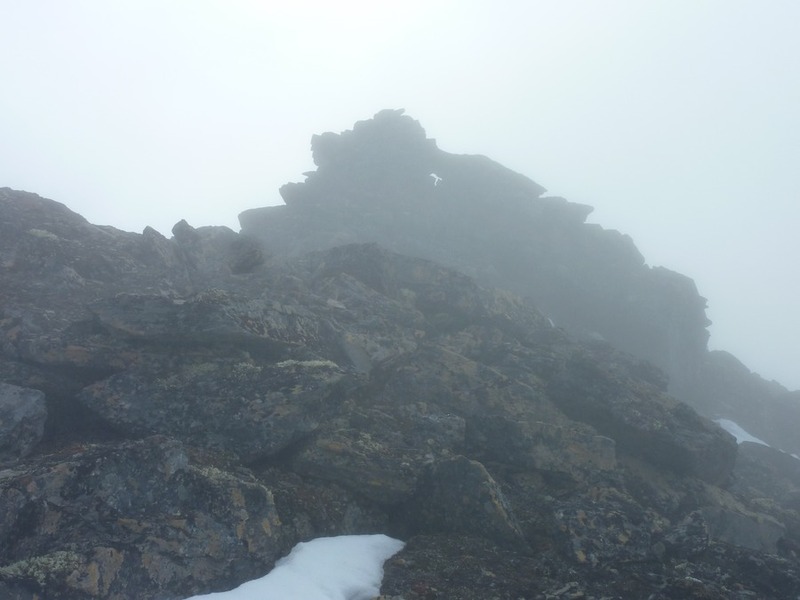 The NE ridge on Jiehtanasgáisi is approx. 500 meters long and has a few narrow passages. However, a rope is normally not necessary, at least in summer. 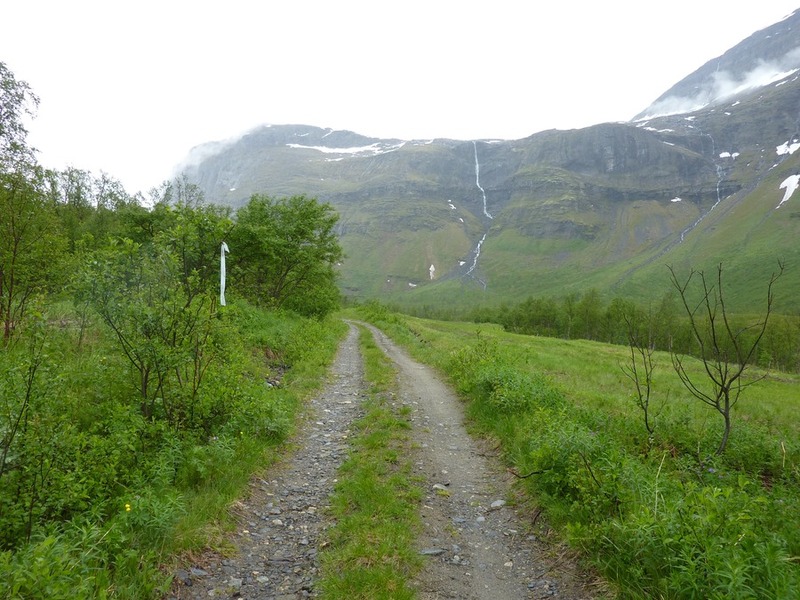 The dirt road in Sørdalen. 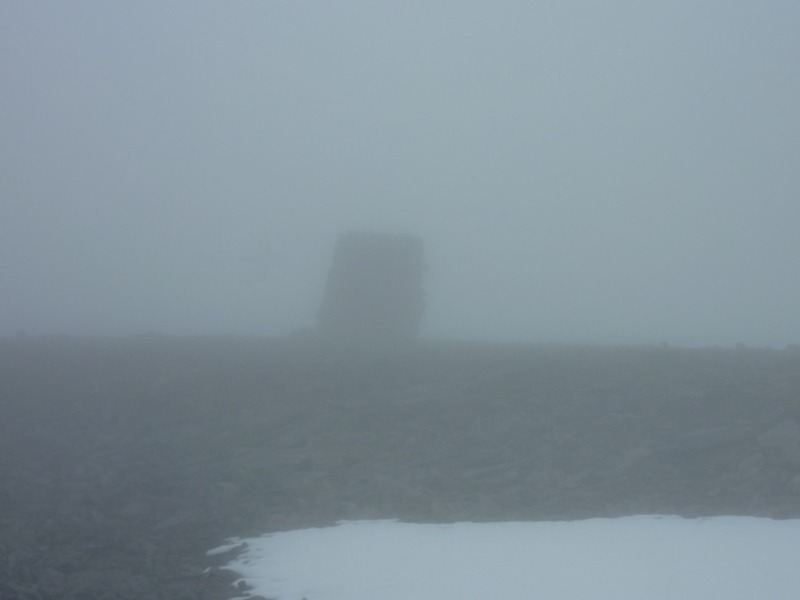 It started to snow when I reached 1200 m.
The first glimpse of the summit cairn on Olmmáivárri. 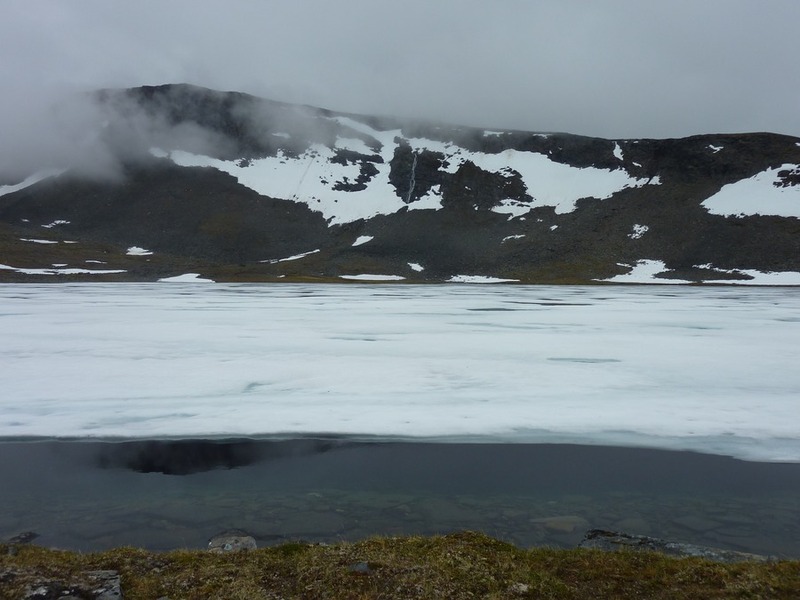 The NE ridge on Jiehtanasgáisi is approx. 500 meters long and has a few narrow passages. Finally a view of the summit of Jiehtanasgáisi (1552). 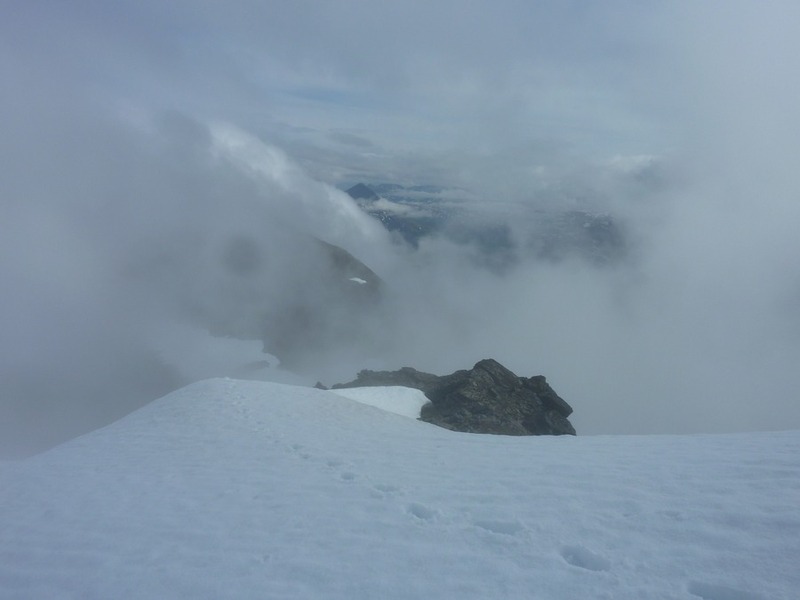 Conveniently the fog cleared for a moment when I reached the airy summit, and I had a nice view of the South ridge and Signaldalen. 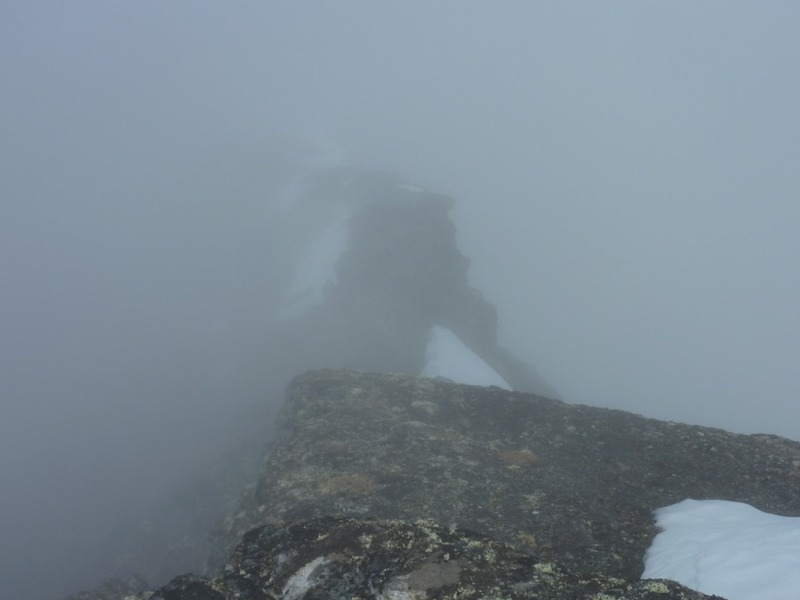 Dense fog on the return along the NE ridge. On top of the buttress. Back by the lake Fiskelaus. 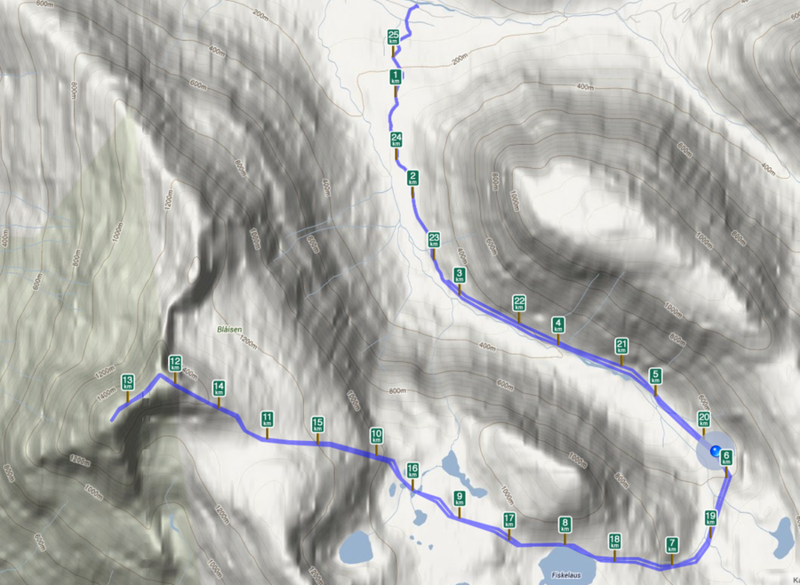 Distance to the summit: 13,5 km. Total distance 27 km. From left to righ: Mannfjellet Point 1448, Olmmáivárri (1533) and Jiehtanasgáisi (1552).